When a writer treats a particular topic and makes you fall in love with it, he or she deserves to be saluted as a great one. 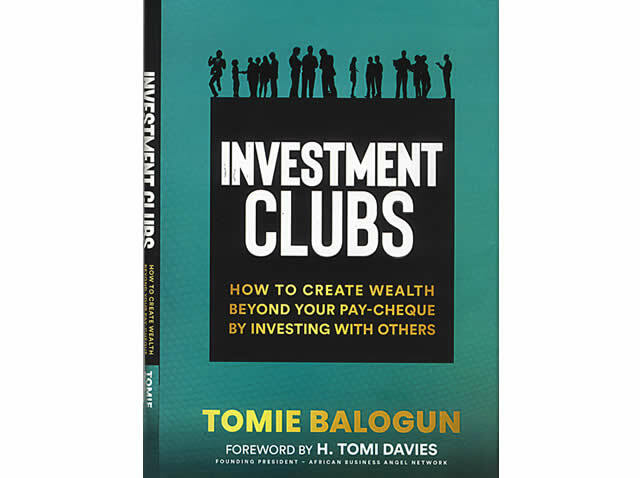 That is why despite the fact that Tomi Balogun is a young writer, she has produced what is close to a great book in Investment Clubs: How to Create Wealth Beyond your Pay-Cheque by Investing with others. In the 173-page book, Balogun is so passionate in her exposition on investment clubs that even anyone learning about it for the first time will not hesitate to join one. And for those who might have been aspiring to be part of it or to establish one, here is a major opportunity to better appreciate its essence and potential. For the author not only puts the advantages in perspective, she also vividly and systematically establishes the process for establishing one. In some 44 chapters coming in three parts, Balogun explains what it takes to start an investment club, managing teething challenges and success that may come. Some of the initial topics areGetting Started with Personal Flows, Why should Anyone Invest, What if I have a Limited Budget? And What it Means to be an Average Investor. On Page 40, Balogun describes an investment club as a group of people who consolidate funds to invest in deals and business opportunities as an entity. “It offers members a great opportunity to share risks and rewards in a way that contributes to the growth of common wealth in society. An investment club offers everyone a win-win solution,” she adds. She goes on to look at the origin and formation operational styles of the clubs and types of membership. Apart from including the experience of existing clubs and individuals who have been involved in it – including Tomie Davies, who wrote the foreword to the book, Balogun also presents down-to-earth suggestions on what she believes the members or intending members should work on. This she wraps in what she calls ‘Tommie advice’, coming after some of the major sections. The book is, indeed, a dependable manual for anyone interested in the ideals of investment clubs. It is rendered in simple but inspiring language just as it is beautifully printed and packaged.